FIIs turned bears, and were net sellers of equity on all five trading days. Their total net selling was worth Rs 24.8 Billion. DIIs were also net sellers of equity on Mon. and Tue. (Feb 11 and 12) but turned net buyers on Wed., Thu. and Fri. Their total net buying was worth Rs 24.4 Billion, as per provisional figures. India’s WPI-based inflation in Jan ’19 touched a 10 months low of 2.76% – down from 3.8% in Dec ’18 and 3.02% in Jan ’18. Lower inflation in fuel and manufactured products led to the fall. Trade deficit in Jan ’19 widened to US $14.73 Billion from $13.08 Billion in Dec ’18, but was lower than $15.7 Billion in Jan ’18. Exports rose by 3.74% while imports grew a meagre 0.01%. Following a failed upward breakout above the Fibonacci resistance zone (between 36140 and 36810), the daily bar chart pattern of Sensex closed lower for six trading days in a row as FIIs turned net sellers of equity. The index dropped below the Fibonacci resistance zone and tested support from the 200 day EMA. For the fourth time since end-Dec ’18, the index breached the 200 day EMA intra-day, but bounced up to close above it in bull territory. The index has been consolidating sideways with a slight upward bias for the past 3 months, which is evident from the gradually rising long-term moving average. Bulls are trying to regain control of the chart slowly and steadily. The battle lines are clearly drawn between the two warring sides. 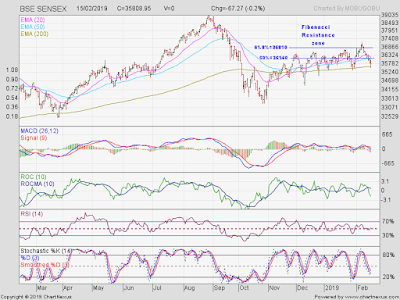 A convincing index close above 37000 will give the advantage to bulls. A convincing index close below the 200 day EMA will tip the scales towards bears. Daily technical indicators are looking neutral to bearish. 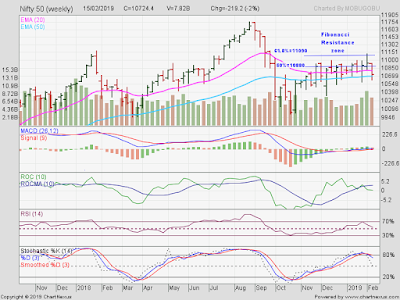 MACD has crossed below its signal line in neutral zone. ROC is falling below its 10 day MA in bearish zone. RSI is moving sideways along its 50% level. Slow stochastic is falling below its 50% level. A near-term technical bounce is possible. 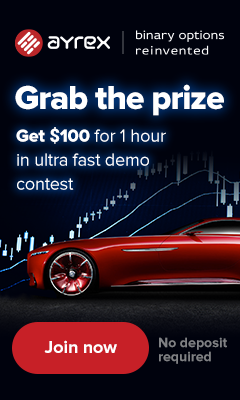 Q3 (Dec ’18) results season is almost over. Another quarter of India Inc.’s tepid earnings growth is not going to help the bullish cause. The Pulwama terror attack and clamour for revenge has added a fresh layer of uncertainty to the stock market. This may be a good time to realign portfolios and invest in fixed income and ELSS instruments. Thanks to FII selling, the weekly bar chart pattern of Nifty lost more than 200 points (2%) on a weekly closing basis, and closed below the Fibonacci resistance zone (between 10880 and 11090) and its 20 week EMA. The index breached its 50 week EMA intra-week, but bounced up to close above it for the 12th straight week. The gradually rising 50 week EMA is an indication that bulls are trying to gain ground slowly. Weekly technical indicators are looking neutral to bearish. MACD is moving sideways above its signal line in neutral zone. ROC has crossed below its rising 10 week MA and dropped to neutral zone. RSI is falling towards its 50% level. Slow stochastic formed a bearish ’rounding top’ pattern before falling from its overbought zone. Nifty’s TTM P/E has moved down to 26.53, but remains well above its long-term average in overbought zone. The breadth indicator NSE TRIN (not shown) has fallen from its oversold zone. A near-term pullback is possible. Bottomline? For more than 3 months, Sensex and Nifty charts have been consolidating sideways after sharp corrections during Sep-Oct ’18. Both indices are trading above their long-term moving averages in bull territories, but continue to face resistances from the zone between Fibonacci 50% and 61.8% retracement levels. The consolidations may continue till the general elections.